Elk Rider Rye Whiskey, one of the spirits in the Heritage Distilling 2018 Spirits Advent Calendar. 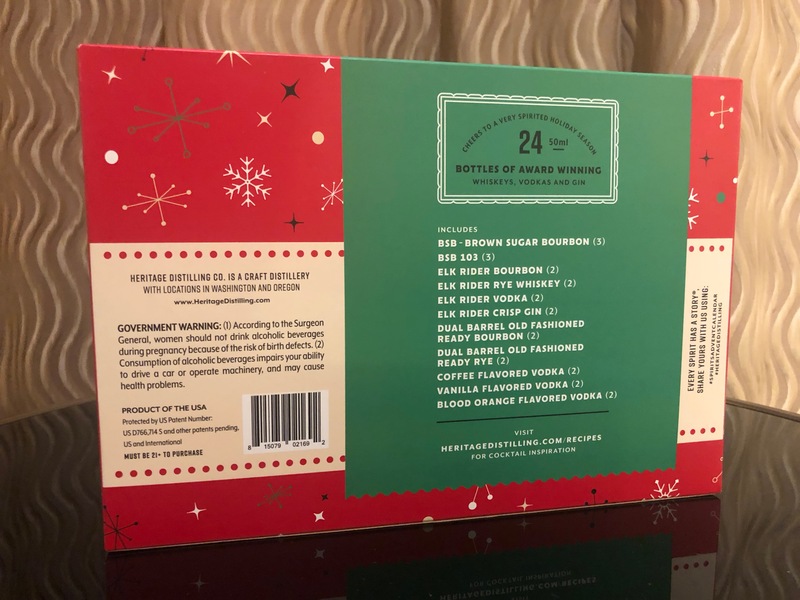 A fun way to explore some new spirits this holiday season is with the 2018 edition of the Heritage Distilling Spirits Advent Calendar. This boozy advent calendar makes its return in 2018 with 24 – 50mL bottles of spirits from Heritage Distilling, good for December 1 – 24, 2018! Each day leading up to Christmas one will get to select and sample one of the spirits produced by Heritage Distilling from Gig Harbor, Washington. Here’s a listing of what is included in the 2018 Spirits Advent Calendar. 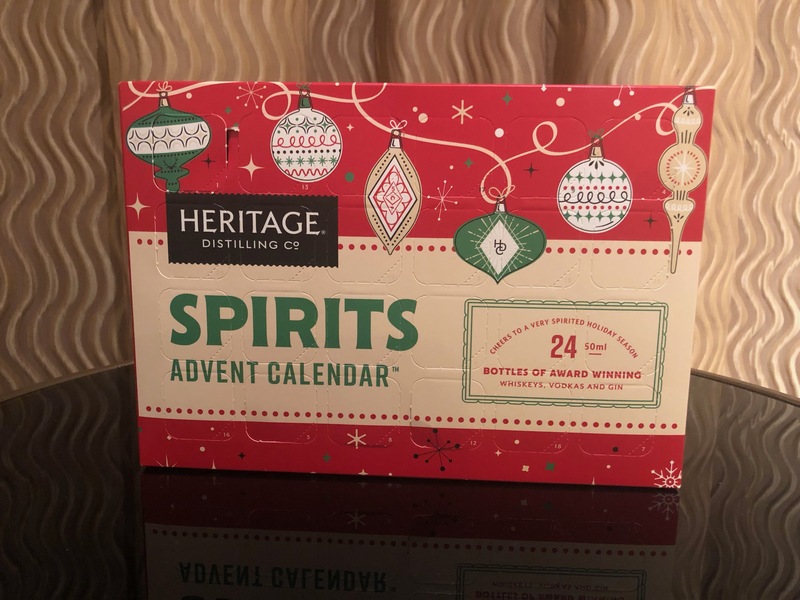 The front of the Heritage Distilling 2018 Spirits Advent Calendar that has 24 windows of booze! The suggested retail for the 2018 Spirits Advent Calendar is $59.99 but it has been found at select liquor stores for less than that. 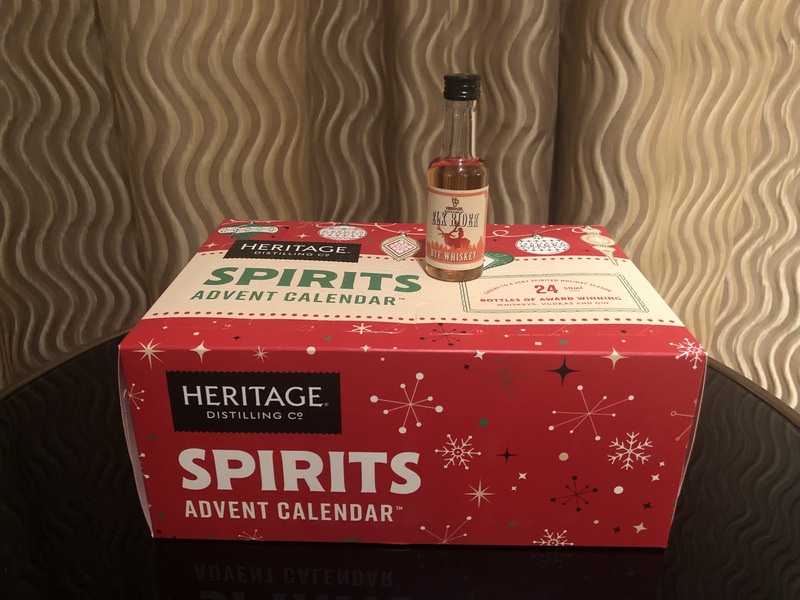 The listing of spirits inside the Heritage Distilling 2018 Spirits Advent Calendar. Heritage Distilling has two distilleries, one at its flagship in Gig Harbor and the other in Eugene, Oregon. The distiller also has tasting room locations in the state of Washington in the Seattle neighborhoods of Ballard and Capitol Hill and the towns of Roslyn and Gig Harbor. These locations can all be found by clicking here. Heritage Distilling spirits and this Advent Calendar can be purchased at each of these locations and at select liquor stores.